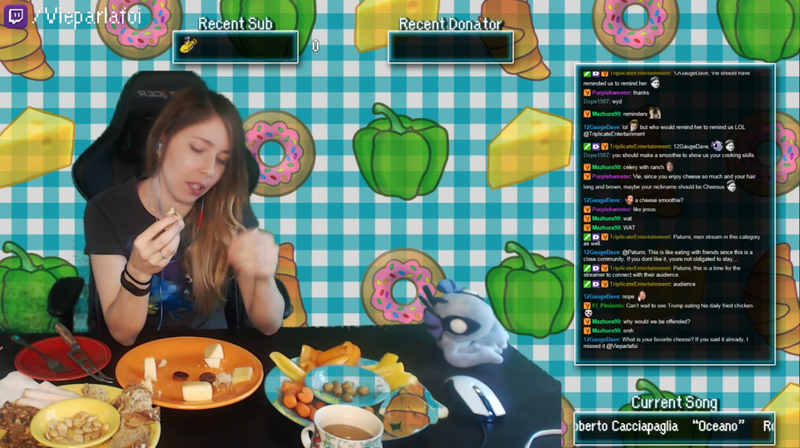 One of Twitch’s new experiments is allowing people to eat meals in front of their audience. The streaming service is called this “social eating,” and there’s some pretty strict (and hilarious) guidelines about what people allowed to do. You can browse through what people are eating by surfing this tag. Right now, it appears someone is trying to eat 100 McNuggets “or bust.” Good luck, buddy! Twitch has since published a detailed FAQ about social eating, not long after someone streamed themselves eating, um, cat vomit and another one ate...poop. While the whole thing is worth reading, I’ve pulled some highlights. Q: Am I required to interact with my viewers during my Social Eating broadcast? A: Yes, you must be interacting with your audience for the duration of your Social Eating broadcast. Interaction could include reviewing the food being eaten or talking about games. Discussions unrelated to food are also acceptable. Q: Am I required to show both myself and what I am eating during my Social Eating broadcast? A: Yes, both you and the food you are eating must be visible for the duration of your Social Eating broadcast. Q: I am primarily broadcasting a game, but I need to have a quick snack. Do I need to switch my category to Social Eating? A: No. If you plan to eat a quick snack and want to continue broadcasting games or Creative content, you could do so while broadcasting a game or on a break, but your channel should stay in the game or Creative directory when doing so. My favorite part of the FAQ, however, is what you can’t do on social eating. Food challenges or contests involving the exchange of money, goods, or services, such as eating or shots, for dares or for money. Feeding others, such as pets or babies. Broadcasting from a moving vehicle, such as traveling to/from a grocery store, market, restaurant, or drive-thru. Broadcasting videos or content from other sites while eating, such as browsing video sites/services or social media. I wonder what this means for “Face stuffing w/ Lord Mayo”?